I used a brown rice spiral pasta from Tinkyada for my dish. It’s one of the two brands of gluten free pasta that I like and use in my cooking. The other brand that I really love is Jovial Foods. I can get their gluten free penne at Natural Grocers, but they don’t carry their spiral pasta at our store. By the way, I just saw that Jovial Foods added three new gluten free pasta shapes to their line-up. Farfalle, elbow macaroni and manicotti. I can’t wait to get my hands on those! 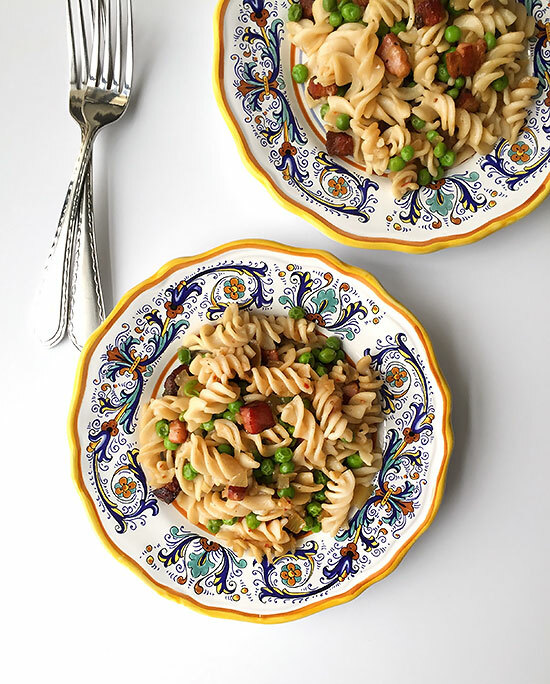 I use and love their Einkorn all-purpose flour, but I haven’t tried their Einkorn pasta yet. 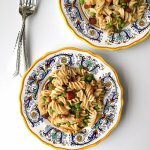 I recently read a great article over on The Healthy Home Economist blog about How to Find the Best Healthy Pasta. She learned while on a Jovial Foods culinary getaway that their brown rice is soaked 24 hours prior to cooking the grain and shaping the dough. This means that the pasta is more easily digested and the nutrients are more readily available. Nice to find a company that is doing things right way! The basil wasn’t looking so great at the store, so I didn’t have any to add to my dish. Some chopped basil and a squeeze of fresh lemon would both be great additions to this pasta dish. FYI: If you happen to be in the DFW area, Local Yocal sells some incredibly tasty pasture raised pancetta. 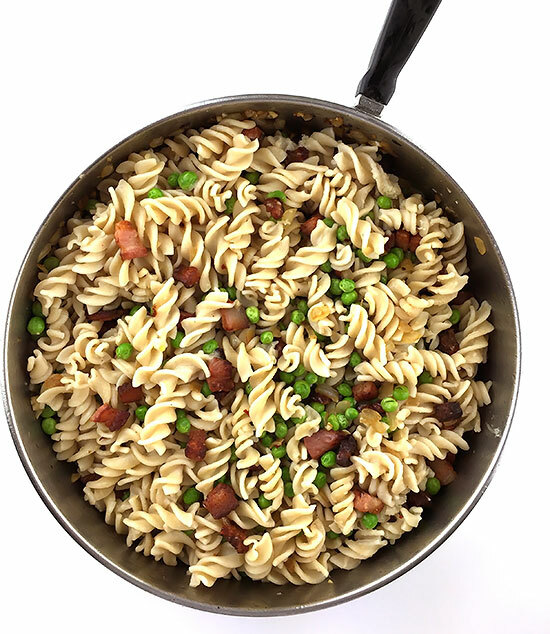 Adapted from Sunny Anderson's Pasta, Pancetta and Peas recipe on Food Network. Bring a large pot of water to a boil over medium heat. Add sea salt and pasta and cook until al dente. Reserve one cup of water and drain the pasta. Meanwhile, heat a large saucepan over medium-high heat, add the pancetta and saute' until crisp and golden brown. Transfer to a paper towel-lined plate to drain. Drain all but 2 tbsp of the grease, add the onions and cook until softened, about 5 minutes. Add the peas and garlic and let cook for another 3 minutes. Add the pasta, pancetta, parmesan cheese and gently toss to combine, adding (a little at a time) some of the reserved pasta water, until pasta is moistened. Serve with extra parmesan cheese. By Tempie at June 14, 2017 .